Much has already been written about the political, economic, financial and social crisis engulfing Venezuela. Despite having one of the world’s largest oil reserves, the country has been in crisis since the onset of the decline in oil prices on the world market. The most pressing impact is the severe shortage of consumer goods, particularly food items and medicine, in all parts of the country. Added to this are the escalating violent crime rate, economic recession, hoarding of consumer goods by some big merchants, looting, power-cuts and water rationing. The contraband trade in consumer items is rampant and the black-marketing of these goods has pushed prices to skyrocketing levels—a situation compounded by currency controls, an inflation rate of over 700 percent, and the steadily rising “informal” exchange rate of the U.S. dollar and other foreign currencies. Prices are routinely determined by this informal exchange rate and they continue to rise since the currency has declined drastically in the past month to 1,000 bolivars per dollar. The government currently maintains three official rates of 6.3, 13.5 and about 200 bolivars per dollar for authorized purchases of “essential” items. In Venezuela’s eastern border states of Bolivar and Delta Amacuro, many among the thousands of Guyanese migrants who settled there during the Guyanese economic crisis of the 1980s currently face intense suffering, leading some to contemplate returning home to Guyana. While food items to that region are smuggled in through Brazil and Guyana across the porous borders, residents complain that members of the Venezuelan National Guard routinely seize most of these goods unless they are paid off by the smugglers. Guyanese nationals in the Ciudad Guayana municipalities of San Felix and Puerto Ordaz (in Bolivar State) say that their regular diet in recent times is sardines, ground provisions and vegetables. Many of them, like those in Delta Amacuro, maintain kitchen gardens and rear poultry and therefore do have some additional food resources on which to subsist. Generally, there is a shortage of supply of food items—a situation which has jacked up prices by more than 400 percent since January on unsubsidized items in supermarkets. At the same time, due to this scarcity, black-market items available in local markets may be obtained at 10 to 15 times more than their normal price. Some Guyanese nationals have indicated that they want to re-migrate to Guyana. At the same time, it is felt that many other Venezuelan citizens in the border regions may move to Guyana, Colombia, Brazil and Trinidad as refugees. But Guyanese President David Granger has firmly stated that though returning Guyanese nationals would be welcomed back, the country is not currently considering accepting refugees. According to a Kaieteur News report on May 20, Granger said Guyana has special interests because of the territorial question between the two countries. He was adamant that the Venezuelan economic crisis could affect the security of the region, and thus Guyana was hoping for an orderly resolution to the situation. 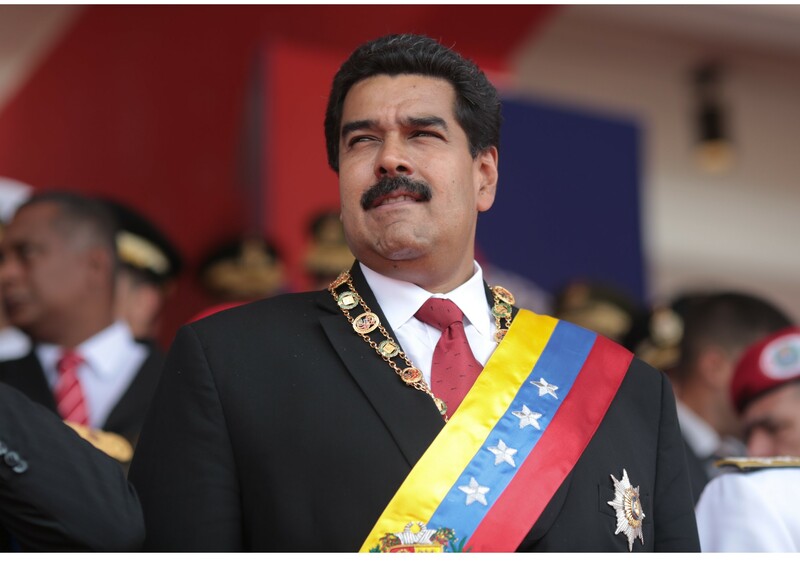 He also expressed concerns over the involvement of the Venezuelan armed forces in the current crisis—an action Venezuelan President Nicolás Maduro has explained as a means to deal with the growing crime situation and the burst of protests. Up to May 2015, the two neighbors enjoyed a trade agreement by which Guyana sold rice largely in exchange for Venezuelan oil under the terms of the PetroCaribe agreement of 2005. However, after a change of government in Guyana that month, relations soured after Maduro aggressively opposed Guyana’s offshore oil exploration activity and extended his country’s territorial claim to almost all of Guyana’s territorial waters—in addition to its existing claim to Guyana’s Essequibo region. Soon after, the Guyanese government cancelled the landing rights of the Venezuelan state-owned airline; Venezuela retaliated by refusing to extend the rice-purchase agreement and soon after Guyana halted oil purchases, even though it remains a member of the PetroCaribe agreement. With the crisis escalating in Venezuela, it would surely be mutually beneficial if the Maduro administration (and the Guyana government) reconsider with some urgency the re-negotiation and re-establishment of the trade arrangement. Meanwhile, President Maduro has been making some efforts to attract economic support from within the region. On May 23, on a visit to Trinidad and Tobago, the Caribbean island nation’s leader, Prime Minister Keith Rowley, agreed to supply manufactured consumer and food items to eastern Venezuela through the creation of a “rotating” Venezuelan $50 billion USD fund. Rowley hoped that this arrangement could provide “some significant relief to the people of Venezuela.” Trinidad’s Trade and Industry Minister Paula Gopee-Scoon later confirmed that food items such as chicken, butter, pork, ketchup, rice, and black beans were among the items that Venezuela had requested. She explained that the Venezuelan government was also expected to send a request for “eight priority items” which would be shipped as soon as they are ready. Many people of Trinidadian heritage reside in eastern Venezuela, particularly in the states of Delta Amacuro and Sucre, and during this year arrivals in Port of Spain from those areas by ferry boats—either to stay or to make large purchases of consumer items to take back home—have been unusually high. Just the day before his Trinidad visit, Maduro travelled to Jamaica where he held discussions with Prime Minister Andrew Holness. The Jamaican leader expressed concerns over the political and economic developments in Venezuela and hoped for the re-establishment of social and political peace in the South American nation. The deliberations focused on cooperation in trade, energy, and culture. The two sides agreed to work toward improving trade, especially through arrangements under the PetroCaribe Agreement. Maduro also announced the continuation of Venezuelan assistance for the upgrade of the Jamaican oil refinery project considered to be imperative to the economic development of Jamaica. However, no information was revealed as to whether there was any decision for Jamaican reciprocal assistance to Venezuela. At the same time Maduro was making his Caribbean visits, the Antigua Observer newspaper on May 23 reported that two Caribbean political analysts have been arguing strongly for the Caribbean region to extend some goodwill to Venezuela in its time of need. Development consultant Melanius Alphonse declared: “We accepted all what they had to offer; I think we can give a little back in return.” In similar vein, political analyst Denys Springer suggested tangible support for Venezuela should come from all the member states of the Caribbean Community. “They have done so much for us even when they were having their own problem and consequently I think that we should be doing something throughout the Caribbean, and I think CARICOM, too, should have a role to play in helping our neighbors because it does not mean they would be in that position forever,” he stated. The declaration also offers support for the initiative of the former Presidents José Luis Rodríguez Zapatero of Spain, Leonel Fernández of the Dominican Republic and Martín Torrijos of Panama to mediate an effective dialogue between the government and the opposition, a process which has already started. The opposition coalition currently controls the National Assembly, some of whose legislative actions have been resisted by the Maduro government. And on June 14, United States Secretary of State John Kerry announced high-level talks to ease tensions between his country and the Venezuelan government. He added that the talks would also be aimed at fostering dialogue between the Maduro government and the opposition. This decision came in the aftermath of discussions Kerry held with Venezuelan Foreign Minister Delcy Rodriguez on the sidelines of the OAS General Assembly in the Dominican Republic. Significantly, Kerry announced also that the United States would not support a push by OAS Secretary General Luis Almagro—formerly a foreign minister of Uruguay—to suspend Venezuela from the OAS for alleged violations of the organization’s Inter-American Democratic Charter. At Almagro’s request, but not necessarily advancing the cause of peaceful reconciliation, the OAS is expected to convene an “emergency” meeting to initiate the process aimed at suspending Venezuela from the hemispheric body. But Almagro’s action has isolated him from the great majority of the members, with even right-wing governments opposed to Maduro in the hemisphere refusing to support his proposal. There is yet no news as to whether this meeting will be convened. Almagro’s posture is widely regarded as part of a personal vendetta against Maduro, and there is a general feeling that he could have better used his position to mediate a compromise between the Venezuelan government and the opposition. However, with his open anti-Maduro stance, he arguably could never have been accepted as an impartial mediator. A political compromise and understanding can surely assist to ease the pressures on the Venezuelan people. In the present circumstances with no side willing to be flexible, the diplomatic mediators will definitely encounter a stiff challenge to reach their objective. How long this task will take is anyone’s guess. In the meantime, the crisis continues to the detriment of the entire nation. “The Truth Behind Shortages in Venezuela.” Resumen LatinoAmericano English. 2016. Accessed June 21, 2016. http://resumen-english.org/2016/01/the-truth-behind-shortages-in-venezuela/. Mogollon, Mery, and Chris Kraul. “Amid Unrest, Looting and Electricity Rationing, Venezuela President Becomes Recall Target.” Los Angeles Times. April 27, 2016. Accessed June 2016. http://www.latimes.com/world/mexico-americas/la-fg-venezuela-crisis-20160427-story.html. Also: “Guyana Hasn’t Considered Venezuelan Refugees.” Kaieteur News. May 20, 2016. Accessed June 2016. http://www.kaieteurnewsonline.com/2016/05/20/guyana-hasnt-considered-venezuelan-refugees/. Tong, Scott. “A Day out at the (black) Market in Venezuela.” A Day out at the (black) Market in Venezuela. March 23, 2016. Accessed June 2016. http://www.marketplace.org/2016/03/23/world/resource-curse/day-out-black-market-venezuela. Biller, David. “IMF Sees Venezuela Inflation Rocketing to 720 Percent in 2016.” Bloomberg.com. January 22, 2016. Accessed June 2016. http://www.bloomberg.com/news/articles/2016-01-22/imf-sees-venezuela-inflation-rocketing-to-720-percent-in-2016. Bloombergsg-yahoopartner. “Venezuela’s Bolivar Falls Past 800 Per Dollar on Black Market.” Bloomberg on Yahoo. September 29, 2015. Accessed June 2016. http://bloombergsg-yahoopartner.tumblr.com/post/130156488726/venezuelas-bolivar-falls-past-800-per-dollar-on. Information drawn from the writer’s conversations with some Guyanese residents of Puerto Ordaz and San Felix..
 “Ishmael Reaches out to Guyanese in San Felix, Puerto Ordaz – Stabroek News.” Stabroek News. April 17, 2008. Accessed June 2016. http://www.stabroeknews.com/2008/archives/04/17/ishmael-reaches-out-to-guyanese-in-san-felix-puerto-ordaz/. Information drawn from the writer’s conversations with some Guyanese residents of Puerto Ordaz and San Felix. The writer’s interview with a leader of a Guyanese community organization in Puerto Ordaz. “Guyana Hasn’t Considered Venezuelan Refugees.” Kaieteur News. May 20, 2016. Accessed June 2016. http://www.kaieteurnewsonline.com/2016/05/20/guyana-hasnt-considered-venezuelan-refugees/. Singh, Ravin. “GUYANA CAN HELP — Greenidge Says Guyana Willing to Assist Crisis-hit Venezuela If Need Arises.” Guyana Chronicle. May 27, 2016. Accessed June 2016. http://guyanachronicle.com/guyana-can-help-greenidge-says-guyana-willing-to-assist-crisis-hit-venezuela-if-need-arises/. Ishmael, Odeen. “Guyana Remains Firmly with PetroCaribe.” COHA. February 24, 2015. Accessed June 2016. http://www.coha.org/guyana-remains-firmly-with-petrocaribe/. Ishmael, Odeen. “New Venezuelan Decree Claims Ownership over Guyana’s Continental Shelf.” Kaieteur News. June 07, 2015. Accessed June 2016. http://www.kaieteurnewsonline.com/2015/06/07/new-venezuelan-decree-claims-ownership-over-guyanas-continental-shelf/. Paul, Jomo. “Guyana Halts Flights of Venezuela’s State-owned Airline.” INews Guyana. June 07, 2015. Accessed June 2016. http://www.inewsguyana.com/guyana-halts-flights-of-venezuelas-state-owned-airline/. Wilburg, Kiana. “Venezuela to Cancel Rice Deal with Guyana after November– Says Finance Minister.” Kaieteur News. July 09, 2015. Accessed June 2016. http://www.kaieteurnewsonline.com/2015/07/09/venezuela-to-cancel-rice-deal-with-guyana-after-november-says-finance-minister/; also: Macklingam, Kristen. “Guyana Officially Loses Venezuelan Rice Market.” Guyana Times. October 19, 2015. Accessed June 2016. http://www.guyanatimesgy.com/2015/10/19/guyana-officially-loses-venezuelan-rice-market/. “Guyana Now Buying Oil from T&T.” Guyana Times. October 19, 2015. Accessed June 2016. http://www.guyanatimesgy.com/2015/10/19/guyana-now-buying-oil-from-tt/. “Caribbean News Now!” Venezuela to Buy US50m in Food from Trinidad and Tobago. May 25, 2016. Accessed June 2016. http://www.caribbeannewsnow.com/topstory-Venezuela-to-buy-US50m-in-food-from-Trinidad-and-Tobago-30506.html. “Venezuela Reiterated Commitment to PetroCaribe during Maduro Visits to Jamaica and Trinidad – St. Lucia Nationwide – The Official News Magazine of the Government of Saint Lucia..” St Lucia Nationwide The Official News Magazine of the Government of Saint Lucia RSS. May 30, 2016. Accessed June 2016. http://stlucianationwide.com/2016/05/venezuela-reiterated-commitment-petrocaribe-maduro-visits-jamaica-trinidad/. “Caribbean News Now!” Daily News and Opinion from the Wider Caribbean. Accessed June 2016. http://www.caribbeannewsnow.com/., op. cit. Rambally, Rhonda Krystal. “Venezuelans Flock to T&T for Supplies.” The Trinidad Guardian Newspaper. May 22, 2016. Accessed June 2016. http://www.guardian.co.tt/news/2016-05-22/venezuelans-flock-tt-supplies. Statement by Prime Minister of Jamaica Andrew Holness at the joint media conference with President Nicolas Maduro, Kingston, Jamaica, May 22, 2016, Jamaica Information Services. Gordon, Theresa. “C’bean Told to Help Venezuela.” Antigua Observer Newspaper. May 23, 2016. Accessed June 2016. http://antiguaobserver.com/cbean-told-to-help-venezuela. “OAS :: Photonews :: FNE-19676.” OAS :: Photonews :: FNE-19676. June 1, 2016. Accessed June 2016. http://www.oas.org/en/media_center/photonews.asp?sCodigo=FNE-19676. “Special Declaration.” Home. Accessed June 2016. http://www.acs-aec.org/index.php?q=press-center/releases/2016/special-declaration. Wroughton, Lesley. “Kerry Launches Talks with Venezuela but Backs Disputed Referendum.” Reuters. June 14, 2016. Accessed June 2016. http://www.reuters.com/article/us-venezuela-oas-kerry-idUSKCN0Z027T. “OAS Head Calls for Vote on Venezuela’s ‘grave Alterations’ to Democracy.” The Guardian. May 31, 2016. Accessed June 2016. https://www.theguardian.com/world/2016/may/31/venezuela-organization-of-american-states-vote-luis-almagro-nicolas-maduro. Wroughton, Lesley. “Kerry Launches Talks with Venezuela but Backs Disputed Referendum.” Reuters. June 14, 2016. Accessed June 2016. http://www.reuters.com/article/us-venezuela-oas-kerry-idUSKCN0Z027T., op. cit.